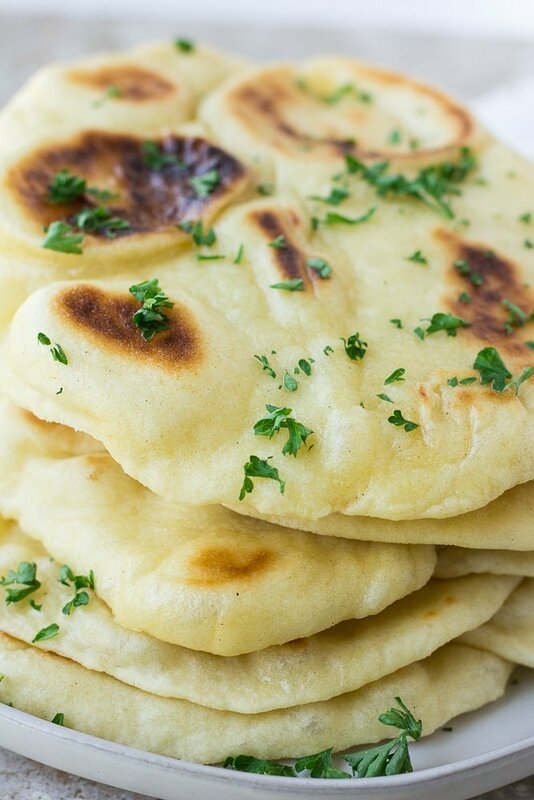 Easy vegan naan- soft, fluffy flatbread perfect for serving alongside Indian inspired dishes or even using as a wrap or pizza crust. Only 7 ingredients and easy to make! Last week I made Vegetable Korma for dinner, and I thought it would be fun to have naan to go with it. Have you ever tried to buy naan at a store? For the life of me, I couldn’t find a brand that didn’t have eggs, milk or both of those in it! So what did I do? I decided to make my own, a vegan version, and wow am I glad I did! 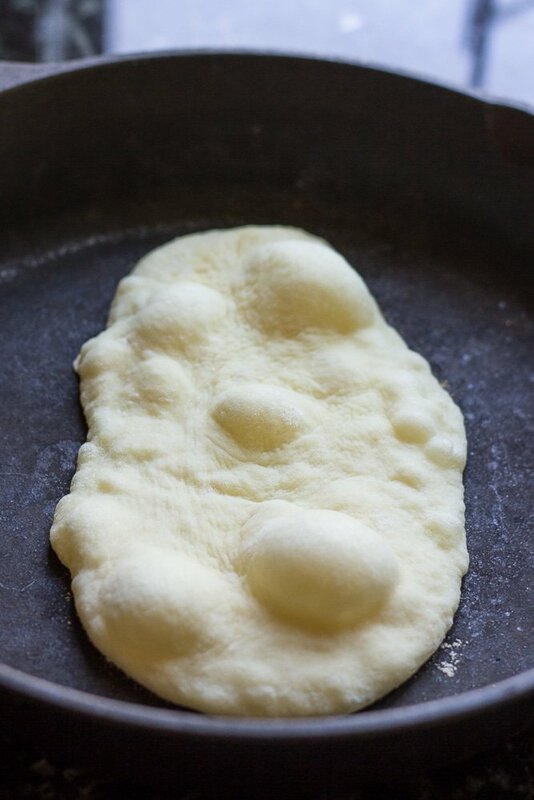 Naan is basically an Indian style flatbread, that is soft, pillowy with beautiful bubbles from cooking it on the stovetop. There is yeast involved, but it’s quite failproof, unlike making a loaf of bread which is a bit harder to get right. 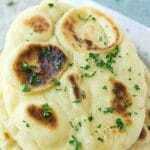 How do you make easy vegan naan? There are just a few simple steps involved in making vegan naan. 2. Let the dough rise for an hour to an hour and a half, until doubled in size. 3. Divide into pieces, roll out into circles or oval shapes and cook in a heavy bottomed pan for a few minutes on each side. See how bubbles form when you cook the first side. The process reminds me of making pancakes! So easy. What should I eat vegan naan with? 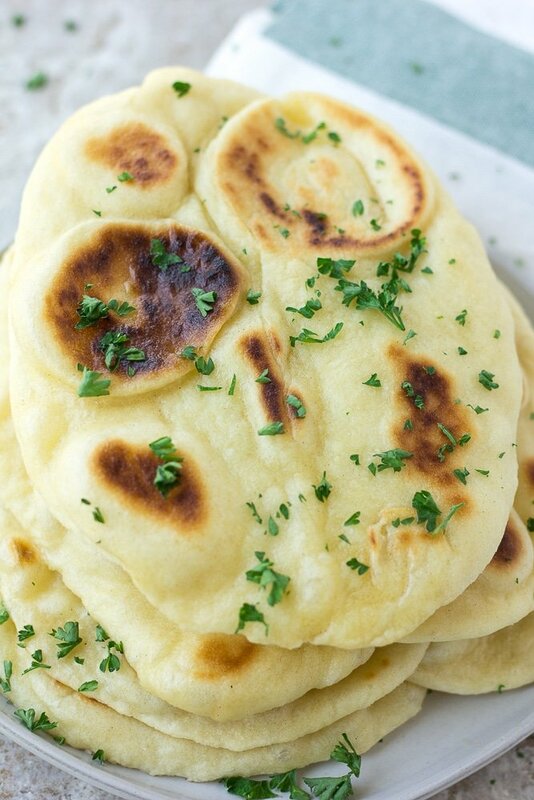 Naan goes great with any Indian inspired dish, such as Quick and Easy Vegetable Korma, Cauliflower Sweet Potato Curry Soup or Chickpea Eggplant Curry. You can also use it for wraps, filling it with Falafel, Chickpea Tuna or hummus and vegetables. It makes a great personal pizza crust- simply top cooked naan with pizza sauce, non-dairy cheese and vegetables. Add the yeast and sugar to a large bowl and pour the warm water on top (think bath temperature, not too hot or it will kill the yeast). Let sit for a few minutes until it is frothy on top. Now add the flour, salt, baking powder, coconut cream and olive oil. Stir with a wooden spoon until it becomes difficult, then turn the ball of dough out on a lightly floured surface (I just use my countertop). Knead the ball of dough for about 3-4 minutes, until the ball of dough is smooth and soft. If it is too sticky, add a little more flour. Place the dough in a large bowl (I wipe out the first bowl I used), cover with a tea towel and let it rise until it doubles in size, about an hour to and hour and a half. After it rises, flatten the dough and divide into 8 pieces. Heat a large, heavy bottomed pan (cast iron preferred) over medium heat. Take a piece of the dough and roll it on a lightly floured surface into a circle or oval shape (about 1/4 inch thick). If using garlic, gently press a little minced garlic onto one side so it sticks at this point. Place the dough on the heated pan and cook until large bubbles have formed and the bottom is golden brown. Flip and cook 1-2 minutes more until that side is golden brown as well. Repeat with the remaining pieces. Cover the naan with a towel or wrapped in foil to keep warm until ready to serve. Serve plain or brush with melted vegan butter and sprinkle with fresh herbs, such as cilantro or parsley. For the coconut cream, open a can of full fat coconut milk or coconut cream, and scoop out 3 tablespoons of the white, thick creamy part. May also substitute plain non-dairy yogurt (soy, almond, or coconut). For oil free, may try substituting more coconut cream or non-dairy yogurt for the olive oil. I haven't personally tried this but I think it would work. This naan is unbelievably good! I was surprised how easy it was, too. Do you think this would work well using a gluten free all purpose flour? I’m not sure as I haven’t tried it, but it may not work out the same. I know working with gluten free flours is a bit tricky! Do you oil the pan at all? What can I do with the rest of the can of coconut milk? You could add it to smoothies. Make creamy vegetable curry or tofu. This sounds both delicious and easy! Would it work with almond or coconut flour? Thanks! Unfortunately, I don’t think it would work with either of those. I’m sure whole wheat, white whole wheat or spelt flour would work quite well, but almond and coconut flour are quite different to work with. This sounds amazing! Do you know if these would freeze well? Yes, you could freeze the naan after cooking. We just eat it so fast it never gets to that point, hah! You can also freeze the dough. I tried it: Naans from defrosted dough is just as good as fresh! 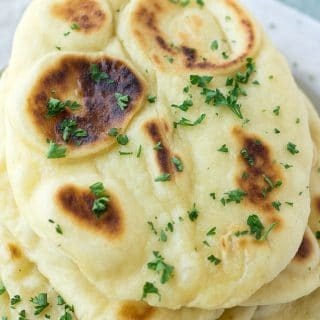 I tried a few vegan recipes for Naan and this one is my favorite by far! Looks amazing! Is there a sub for something lighter than coconut cream? Like vegan yogurt or sour cream? Yes, either non-dairy (unsweetened) yogurt or vegan sour cream should work. Thanks! This naan was a big hit! Both myself and the SO loved it. Will try the oil free next time, I just didn’t want to stray from the original recipe on the first go. Made with your falafel and added carrots and cucumber, delicious!